When Bishop Simon Bruté College Seminary in Indianapolis began forming men for the priesthood in the fall of 2004 on the campus of Marian University, its enrollment stood at six. It is now at 33 with seminarians being sent there from nine dioceses across the country. Father Robert Robeson, rector of the seminary, expects enrollment to rise above 40 next year. The seminary moved in 2008 to the former Carmelite Monastery of the Resurrection, about a mile south of Marian, where seminarians still take classes. Because of the growth of the seminary, its chapel, which had a seating capacity of 40 people, was renovated last summer. It can now seat 80 people. Archbishop Joseph W. Tobin blessed the renovated chapel during a Jan. 28 Mass at the seminary. The Mass took place on the feast of St. Thomas Aquinas, the great 13th century Dominican priest who continues to be regarded as one of the Church’s greatest philosophers and theologians. 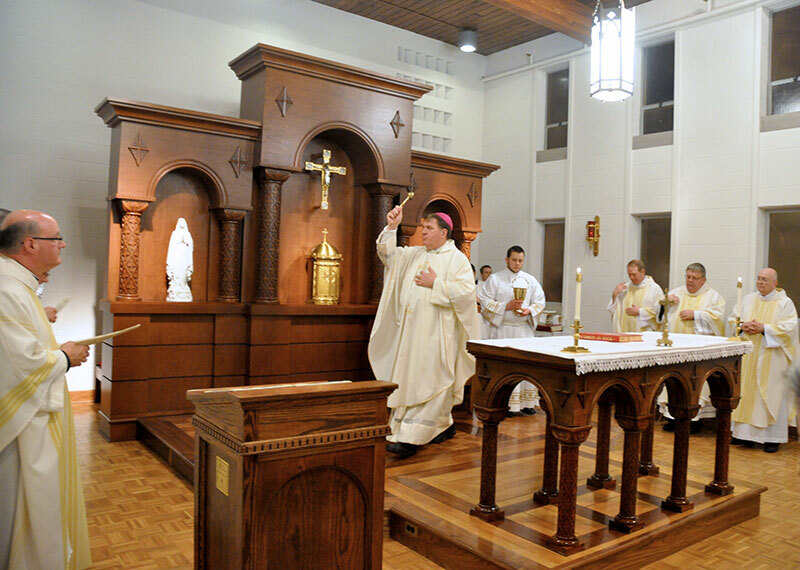 “The example of Thomas Aquinas can teach you that this chapel is not only a place of worship, where you will be nourished at the table of the Lord’s word and sacrament,” Archbishop Tobin told the assembled seminarians. “It is also a sort of study hall or, if you will, a research laboratory. Seminarian Timothy DeCrane, a junior at Bishop Bruté, comes to the chapel daily to pray. A member of Most Holy Name of Jesus Parish in Beech Grove, DeCrane sees the expanded chapel as an encouraging sign of growth for the seminary. Seminarian Anthony Stange, a senior at Bishop Bruté and a member of St. Lawrence Parish in Lawrenceburg, said the expansion of the seminary’s chapel is also a sign of a more hidden growth—the increase in the seminarians’ knowledge of themselves and their love for God. Also attending the chapel blessing were four members of the Monastery of the Resurrection, now living on the grounds of the motherhouse of the Congregation of the Sisters of the Third Order of St. Francis in Oldenburg. Carmelite Sister Jean Alice McGoff, the monastery’s prioress, spoke after the Mass about how happy she and other members of the community are about the continuity in the use of their former home. Franciscan Sister Jean Marie Cleveland, vice president for mission effectiveness at Marian, also attended the Mass. One person who was not able to attend the blessing Mass, but who was likely on the minds of many present, was Archbishop Emeritus Archbishop Daniel M. Buechlein, who founded the seminary in 2004. Archbishop Tobin recently visited him in the infirmary at Saint Meinrad Archabbey in St. Meinrad where Archbishop Buechlein lives and spoke about the visit at the end of the Mass. While the renovation of the chapel was largely completed last summer, work at expanding the seminary’s buildings continues. Last fall, construction of a new dormitory and dining hall began. When completed, the residence hall will have 10 double occupancy rooms, and the seminary will be able to house 54 seminarians. It is expected that the dormitory and dining hall will be ready for use at the start of the 2013-14 academic year. The overall cost of the chapel renovation and the current construction project is an estimated $2.4 million. Approximately $2 million of this was made available through a bequest from the estate of the late James P. Scott, the largest estate gift in the history of the Archdiocese of Indianapolis. The rest of the $7.5 million Scott gift was used to establish an endowment to support the future ministry of the Church in central and southern Indiana. Several other donors also contributed to the renovation of the seminary chapel and the construction of its new dormitory and dining hall.